To stay or not to stay (on property), that is the question…! This is a hotly contested issue among Disney-goers. Personally, we stay at a Walt Disney World resort every time we take a Disney vacation, and would never consider doing otherwise. And here’s why! As a guest at a WDW resort, you’ll enjoy free transportation from the airport to your resort – and Disney will even retrieve your bags from the airport and deliver them to your room! When your vacation ends, you can quickly check your bags at the resort, and then enjoy the day in the parks until you need to take the Magical Express to the airport for your flight home. One of our favorite perks of staying on property, Extra Magic Hours are offered every day for one of Walt Disney World’s 4 parks. The park will either open an hour early, or stay open up to 2 hours later, than normal – but only for guests of a WDW resort! With fewer guests in the park, this is the perfect time to get in line for any rides you couldn’t snag a FastPass+ for. Side note – guests can also enjoy the Extra Magic Hours benefit from January 1- December 31, 2018 with valid theme park admission and Extra Magic Hours benefit voucher while staying at a Disney Springs Resort Hotel. Visit DisneySpringsHotel.com for a list of these hotels. Guests staying at Shades of Green on Disney Resort Property are also eligible for Extra Magic Hours. Walt Disney World service is, simply put, the best! Disney cast members go out of their way to make every guest’s day magical, and we’ve never found a higher quality of service anywhere else. 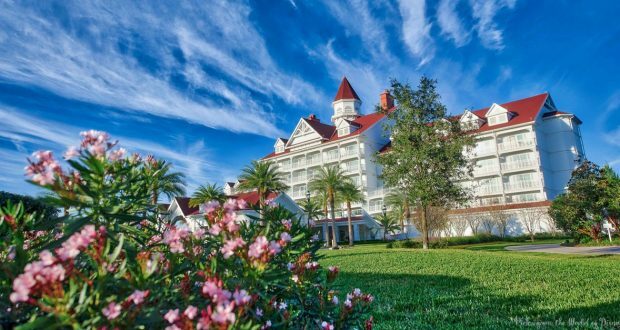 So if you don’t want to feel like you’re leaving your Disney vacation behind when you leave the parks and return to your resort, you’ll want to stay on property! We set aside at least one day of each Walt Disney World vacation as a “resort day” – and most of this day is spent enjoying our resort’s pools! All Disney resorts have stunning pool complexes matching the theming of the resort. Depending on your resort, you might find a sea serpent water slide, a massive Mayan temple, or a giant pirate ship to explore during your down time! We’ve often written about Walt Disney World’s diverse system of complimentary transportation. No matter what WDW resort you call home while on vacation, there are fast and free options to get you where you want to go! The WDW Monorail System is our favorite way to travel, but you can also take a bus, water taxi, and, from some resorts to some parks, you can even walk! Stay off property, and you’ll pay at least $25 a day to park a vehicle at one of Walt Disney World’s theme parks. But if you’re a guest at a Walt Disney World resort, you can park for free at all of the parks. Keep in mind, you’ll still have an overnight resort parking fee if you have a vehicle at your Disney resort. There are however some exceptions to those who have to pay including handicap and DVC members staying at a DVC Villa. This is one of the biggest perks of staying at a WDW resort! Instead of waiting until 30 days before your park visit to make FastPass+ reservations, you can start making your selections online at the 60 day mark. And trust us when we say this extra 30 days makes a big difference! (Good luck getting a FastPass+ for Flight of Passage or Slinky Dog Dash if you’re staying off property, for example!). Side note – guests can also make FastPass+ selections 60 days in advance while staying at one of the Disney Springs Resort Hotels January 1- December 31, 2018 with valid theme park admission. Visit DisneySpringsHotel.com for a list of these hotels. Guests staying at Shades of Green on Disney Resort Property are also eligible for the 60 days window for FastPass+ selections. You’ll also be able to make advanced dining reservations as a guest at a WDW resort. Anyone can book a dining reservation 180 days in advance, while WDW resort guests get an additional 10 days. This may not seem like a lot, but for popular restaurants like Be Our Guest, it can be the difference between getting and not getting a dinner reservation. Guests who stay off-property can purchase MagicBands, but if you’re staying on property, you’ll get yours for free! Everyone in your party will be able to choose a color for their MagicBand while you’re planning your vacation; they’ll either be shipped to you before you depart, or be waiting for you when you arrive, depending on your country of residence. We’ve often taken advantage of this resort perk. To avoid having to carry all of your souvenirs around the parks with you, you can have all of your purchases sent back to your resort, where you can pick them up the next day. So spend away! If you’re looking to purchase the Disney Dining Plan (a prepaid meal plan where you pay for meals by cashing in credits, and can save money by using your credits wisely), you’ll need to be a guest at a Walt Disney World resort. Currently this perk is not available for guests staying off property. If you’re staying on property, you can charge anything on property – from merchandise in the parks, to meals at your resort – to your room, simply by swiping your MagicBand. It’s never been easier to spend your way across Walt Disney World! Walt Disney World offers a dizzying array of in-room celebrations to make a special occasion more special, or just to surprise a special someone on vacation. We once received an in-room Halloween basket and ghost balloon, which was amazing! You can also go all out and purchase elaborate character or event-themed packages including snacks and treats, decorations, plush toys, character bedding and more. Food options abound at each resort! You’ll find table service restaurants and a variety of counter service meals at every WDW resort; plus, you can pick up items like cartons of milk, popcorn, boxes of cookies or crackers and more to take back to your room. A hidden perk to all Disney resorts is the wide array of activities available on site. From complimentary activities like marshmallow roasting, movies under the stars, and pool-side games, to ones with extra costs (archery, horse-back riding, boating, carriage or sleigh rides and more), there’s always something fun to do at a Disney resort!